"Never shall I forget that night, that first night in camp, which turned my life into one long night..."
This is a hard book to review because of its sheer power and emotional impact it had on me. When it comes to non-fiction that is this harrowing, I question how justified I am in critiquing it at all. Short answer: I'm not. Instead I'll express the facts. 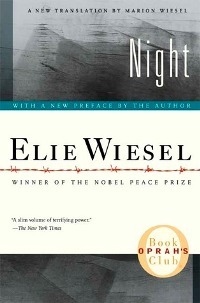 Night is one man's story of his experiences in concentration camps during World War II. Elie Wiesel won the Nobel Peace Prize in 1968 for his "message of peace and commitment to embrace all repressed peoples and races." Sharing his experience in WWII concentration camps was Wiesel's first step in his call for peace and tolerance toward Jews and other persecuted religious and racial groups. The title "Night" works on a few different levels. Most simply, it's a metaphor for the sense of darkness that permeated Nazi controlled Europe, signifying the idea that the days felt like night because of the gloom and despair that continuously pervaded day to day life. There was also a reoccurring theme of disappearing into the night, being taken from the places you once called home without a trace. The novel reads like fiction, communicating the horrific cruelty that the human race is capable of and the incredible instinct to survive in a nearly hopeless situation. Needless to say, Night does not end on a hopeful note. Wiesel states, "One day when I was able to get up, I decided to look at myself in the mirror on the opposite wall. I had not seen myself since the ghetto. From the depths of the mirror a corpse was contemplating me. The look in his eyes as he gazed me never left me." This was a tough book to read; its an intensely disturbing account of torture and trauma, physically and mentally. I was thankful it was on the shorter side because I honestly don't know that I could handle a 300-plus page novel so intense. Wiesel's followup to the book, Dawn, was published in 1960. I can only hope (and loosely assume based on its title) that he was able to begin to cope with the horrific experiences he endured. I read this for the classics challenge, fulfilling a classic literature in translation. I first read this book with a class of 10th graders when I was teaching high school. To put it mildly, it was an eye-opener for me and for them, too. Many of them had never learned of the Holocaust because they always "ran out of time" in their history courses. Crock. But anyway. We did a whole unit on the Holocaust and reading this one took us into a number of really good discussions, and it's a book I'll always cherish. Wow that must have been quite the experience. I think a group reading of the book would be very powerful. This sounds intense/kind of awesome in the worst kind of way. Like, I like to read about the Holocaust, but it's in no way enjoyable, so I can see why this is difficult to review. I kiiind of want to read this, but maybe only when I'm exceedingly happy so it doesn't make me want to kill myself? Well it's definitely a downer but it's not that bad. It has been years since I read this one, but I remember how intense it was. It is a tough read. I never read his other books, but I would hope they would be filled with a little more hope. If I see his follow up I would buy it. Hopefully it's a little more uplifting. What a powerful story. I had a had time reviewing this one too. I want to re-read this book but at the same time just reading a summary of this makes me cry so I don't know if I can handle the whole book again. You're right that this is an (almost) impossible book to review. Good job! Thanks, Red! I really struggled with how to review it. I'm actually quite proud of myself for not crying during this book. I came VERY close twice but managed to hold my tears in. I've had this one on my shelves for so long. After reading Primo Levi's Survival in Auschwitz, I've been hesitant because it's just so terribly sad. What else could it be? Thanks for the thoughtful review. Exactly. You've got to be ready for it, but at least it's short so you aren't reading this massive depressing book. This is a tough book to read - but the horrific imagery just reaches out and grabs you like no other Holocaust book. Great review! Definitely. The imagery from this book will haunt me for awhile. Oh, what an intense book. I must have read and reread that quote you opened with several dozen times when I first read this book. My ninth grade English teacher actually read this ALOUD to the class. I don't know how he got through it. I remember the day he read the hanging scene aloud I just stared out the window, fighting the tears and nausea with everything I had in me. Kudos to you for reviewing this. I think I would have a very hard time writing a review. Oh my gosh I don't think I'd have the strength to read this aloud at all! I'm sure it was quite powerful though. I actually first read this book when I was in elementary school and it had a huge effect on me. Its one of those books that everyone should read I think. I agree. I read the Diary of Anne Frank in grade school and it had a similar effect. It is much different than Night, but also quite harrowing. I just read it this weekend, and wow! What a book. I find it pretty incredible that he was able to write about his experience in such a way. It's a book I'm very glad to have read--a necessary part of Holocaust literature I think. Agreed, Melody. It is a necessary read for Holocaust literature. Even war literature. I love this book...When I had to read it in high school, I went home with the instructions to just read the first chapter...except I ended up reading the whole thing in one sitting! Highly, highly recommend this book to everyone. It's a stunning book in itself and the fact that it's about such a horrible event in human history makes it jaw-dropping. I bet it is a quick read I couldn't imagine just reading one chapter. Great review. I read this book years ago and can still remember how hard it hit me. I still need to read his other books at some point. Me too I'd really like to read his follow up to this one. This is a book that will stay with you throughout your life. Hard to read but absolutely worthwhile. Elie Wiesel is a RELENTLESS writer. If you liked this one, try, BETWEEN TWO SUNS. I bought this a few weeks ago, but I'm scared to read it. I can only imagine how distressing some of the scenes are going to be and I'm not sure I want those images in my head. I feel I should read it - perhaps I'll save it for a bright, sunny day when I'm less likely to get nightmares. Your review is the perfect way to do this book justice. Don't be scared! I get nightmares VERY easily and I didn't get any from this one. I read this in junior high but don't remember it. Sounds like something I should read again. I feel like I'm the only person who didn't have to read this in school! Great review of a difficult book. I know I've read this, but I think I blocked most of it out. Great review.